Dervla Murphy is a travel writer who likes to keep things simple, whether by bike or foot Murphy is best known for travelling alone and unaided, without luxuries and depending on the hospitality of local people. She has visited – Azerbaijan, Siberia, Cameroon, the Urals, Madagascar, Coorg, Rwanda – her 23 books have all been startling, vivid and gripping. Originally intended as a single chapter in a book about her travels in Palestine, ‘A Month by the Sea’ chronicles her experiences in Gaza – Bombed and cut-off from normal contact with the rest of the world, beset with structural, medical and mental health problems, yet also bursting with political engagement and underwritten by an intense enjoyment of family life. There are few travel writers better placed to capture this than Dervla Murphy. She will be joined in conversation by travel writer Hugh Thomson. 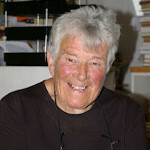 Dervla Murphy’s book A Month by the Sea Eland Publishing Ltd (23 Jan 2013).